John Bogle died yesterday This is not an investment blog but he was the most influential investor to me personally and if you don't follow the markets, John Bogle was the most important innovator in the market in recent memory that you never heard of. Everyone has heard of Warren Buffet and Bill Gates and Jeff Bezos, but most people don't know who John Bogle is and what he accomplished. If you trade on the stock market in mutual funds, whether through indexing or not, you owe John Bogle a debt of gratitude and he has almost definitely saved you a bit of money so I thought it would be worth it to talk about him accomplishments. John Bogle had a couple of radical ideas that were extremely simple. 1) Almost nobody is smart enough to consistently beat the average stock market return long term. 2) Fees, taxes and inflation matter a great deal. Bogle argued that psychologically we tend to throw money at the latest money manager who has beaten the market because we don't want to miss out on the great returns they are about to dole out. The problem is that by definition there is always someone who is doing better than average. The more likely outcome after they beat market short term is regression to the mean which is below average returns. Everyone who invests in the stock market will always receive 100% of the stock market returns. You are paying someone to hopefully get better than average which is a rare feat. There are almost no fund managers out there who have consistently beaten the average return long term. Warren Buffet of Berkshire Hathaway (BRK.A though you are more likely purchasing BRK.B) is a notable exception to this and I would argue that Thomas Gayner of Markel (MKL) is another exception. I'm sure there are others and I don't consider myself an expert here but the point is that even those have done it in the past have no guarantee for the future. As I said before, all investors will by definition receive the return of the entire market. The entire market minus fees, that is. You see if the entire market return was $10 and 5% of that was paid out in fees to brokerage houses for advice and commissions that means that there is only $9.50 for everyone to share. 5% is more than your average fund manager takes (though hedge funds typically 2% of funds under management and 20% of profits) but even at 1% which is pretty common, fees tends to cripple your return long term because of compounding returns. I'll give you some examples so you can see how bad it is. 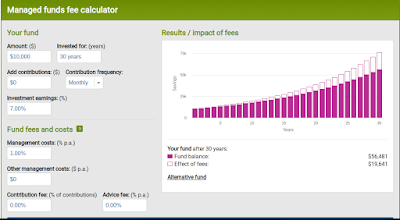 If you start with $10,000 and you invest it for 30 years and got a 7% return and paid 1% in fees, your balance would be $56,4891 which is a 460% return but you would have paid $19,641 in fees over those 30 years. That means you are sacrificing another 200% of your initial investment. Get that down to 0.50% in fees and your same 7% gains change to a balance to $65,573. It's a difference of more than $10,000 in fees! 100% of your initial investment. The more you invest the bigger impact of the fees and the longer you invest the bigger the impact of the fees. You can play around with the numbers here. Taxes matter because the only way that a fund manager can beat the market is either to purchase better stocks and hold onto them or to continually weave in and out of stocks to buy low and sell high. This leads to large tax liabilities (hopefully!) even though you are putting the money back in the market. Inflation matters because you are paying a premium in risk by putting your money into equities and if inflation is going to eat at the real value of your gains is it really worth the risk. If you read books on behavioral economics you will found out that Humans don't always do the most logical things. I'd recommend either The Undoing Project by Michael Lewis or Predictably Irrational by Dan Ariely if you are interested in general (both affiliate links). The point is that when we see the stock market go up, we get greedy and don't want to miss out and we buy stocks. It's based off recency bias and FOMO. When the stock market is crashing we get scared and sell. This is the literal opposite of what you should be doing. As things crash you should be buying stocks and as stocks are heating up that's the time to sell. As Warren Buffet says, "Be greedy when others are fearful and fearful when others are greedy." The other problem is that it is usually impossible to know when the market has topped and when the market has bottomed so even if you wanted to follow Buffet's advice, most people wouldn't know when to execute. Bogle championed the idea of an index fund to solve these problems and he founded Vanguard to do it. As opposied to picking a few stocks, you pick all the stocks in the S&P 500 (or whatever else you are indexing). That means that you are going to buy a piece of the entire economy. Who is going to win between apple and microsoft? Who cares!!!??? One of them will or a newcomer will and you will own a piece of that so as long as the economy keeps chugging forward you will get the gains of the entire market. Index funds also allow for very very low fees. You don't have to pick stocks, you are buying everything so you don't have to pay a manager for his "brilliance," anyone can do it. You see I can buy an index fund that is set up the same way as any other index fund. Every brokerage house has them now so they compete on low fees because for the most part that's the only thing you can compete on for index funds. Index fees got so popular because of their low fees and the average investor started caring and talking about fees that even active funds had to slash their fees to compete so if you own any funds, even active ones, you have John Bogle to thank for their relatively low fees and all the money you get to keep instead of lining the pocket of the fund manager. You should also not time the market. Try not to even look at the market. Consistently add to your index funds over time. You will sometimes add when the market is high and sometimes when it is low but as long as you don't panic and sell when it is low or get greedy and throw in extra when it is high, your purchase price risk is gone. The market can have wild swings short term but long term (horizon of decades) you are almost guaranteed to make good money in the stock market. If you want to know more about his method, you can read one of his books. The one I read is called "Common Sense Investing" (also an affiliate link). It is short and well worth the read. I have mentioned this a few times before but besides my regular investing, I use my credit card points (the cashback ones at least) to invest in the market following the "Boglehead" method. The cashback gets transferred to Fidelity. Doesn't have to be Fidelity but I will explain why I do that. Every time I earn enough for at least one share of ITOT I purchase more. ITOT is an index fund that is the S&P top 1500. I used to invest in IVV which was the S&P 500 but it costs over $250 per share which makes it harder to buy with small amounts of money since you need at least $250 to purchase even one share. The advantage for them is both in fees and commissions. If you have a Fidelity account it is commission free to trade any iShares ETF like ITOT so buying 1 share at a time doesn't cost anything extra. Their management fee is 0.03% which is one of the best on the market. 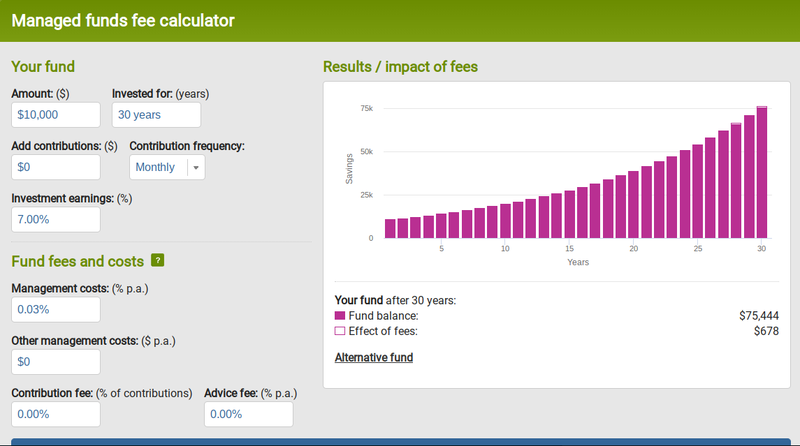 Going with that same initial $10,000 investment, you would save another $10,000 of fees over 30 years a 0.03% compared to 0.5%. That's a big difference!